On the occasion of READYMADES BELONG TO EVERYONE, please join us for a talk by Chandraguptha Thenuwara in which he will discuss the socio-political background of Sri Lanka in the 1980s and 1990s and his engagement since 1997 with anti-war art, paying particular attention to the creation of his work, Barrelism Tourist Map. Thenuwara writes: “In July 1983, the pogrom was orchestrated, creating a new political landscape in Sri Lanka, which changed periodically. Due to the ‘1983 Black July’ happenings, the ethnic war started and escalated for over three decades. In this talk, I will discuss the origins of my anti-war art expressions which were introduced in 1997 as a result of eye-witnessing Black July. Although it continues today, there were three specific phases which I named as Barrelism (1997-2006), Neo-Barrelism (2007-2009), and Post-Barrelism (2009-2014). All phases were based on or triggered by ‘ready-mades’ which appeared during the three decades of the ethnic war. These phases cover how barrels became a part of the socio-political landscape, how ‘national security’ created security checkup points, how roadblocks and barricades started, and how they became a day-to-day ritual. All of these phases have socio-cultural and political connotations. I will explain how the visual condition of these connotations changed, how society as well as the mindset of the people accordingly changed, and finally how it reflected on some extreme political views. I will discuss how ready-mades influenced my work and how I transformed ready-mades for my artistic expression. Chandraguptha Thenuwara (b. 1960, Sri Lanka) lives and works in Colombo. He is a senior lecturer, faculty of visual arts and the Director of the Internal Quality Assurance Unit, University of the Visual and Performing Arts in Colombo. In 1993, He founded the Vibhavi Academy of Fine Arts (VAFA), an artist-run alternative art school. He studied painting at the Institute of Aesthetic Studies, University of Kelaniya (1978-1981) and Surikov State Art Institute, Moscow, Russia (1985-1992); and received his MPhil at the Post Graduate Institute of Archeology (PGIAR), Kelaniya University (2006). Since 1978 he has exhibited widely in Sri Lanka and abroad. His works are also included in the collections of the Queensland Art Gallery, Australia; Fukuoka Asian Art Museum, Japan; John Moore’s University Art Collection, Liverpool; and Fine Arts Museum of Udmurtia, Izhevsk, Russia. His public monuments include the Seeduwa monument to the Disappeared and Monument to Neelan Thiruchelvam at Kinsey Terrace Colombo. From December 2015 to May 2018, he was appointed as the President of the Arts Council of Sri Lanka. He is an active member of ‘Purawesi Balaya’ (Citizens’ Power) organization. 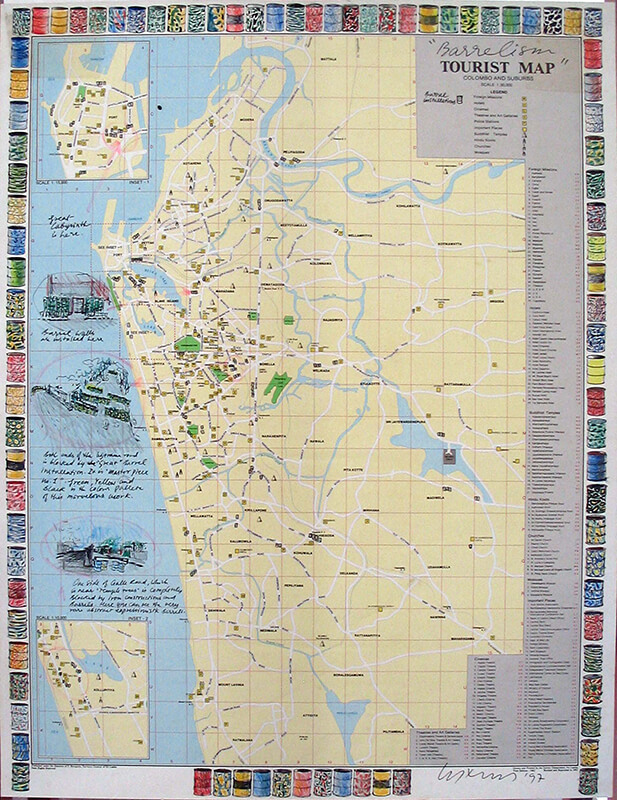 Image: Chandraguptha Thenuwara, Barrelism Tourist Map, 1997.